Observations: Pickens' project failure demonstratesfutility of rushing "green energy"
futility of rushing "green energy"
The CBS News headline proclaimed “Pickens Plan for Huge Wind Farm Blows Away,” as Texas oilman and billionaire financier T. Boone Pickens latest venture to build a huge wind farm to demonstrate the viability of alternative energy has instead become a demonstration of why such ideas are not viable. His plan was unveiled last year in the face of highest-ever oil and natural gas prices, when oil prices peaked at more than $145 a barrel and wholesale natural gas reached $47.61 per cubic meter, making his plan for a 4,000 megawatt wind power project in Pampa, Texas look very appealing. Had the project been completed, it would have produced electricity equivalent to four nuclear-power plants and would have powered 1.3 million homes. But, alas, it won’t be completed. Mr. Pickens has a goal of reducing oil imports by 30 percent in ten years by replacing oil with natural gas in cars and trucks and using wind power to replace natural gas as a source of electricity. Among the reasons for the decision to abandon the wind project were "the collapse of the capital markets" and "the steep downturn of natural gas prices,” a spokesman for Mr. Pickens' company told The Washington Post. Lower natural-gas prices, down to $27.86 last weekend, made the more expensive wind power less desirable as an alternative to gas-fired electric plants. 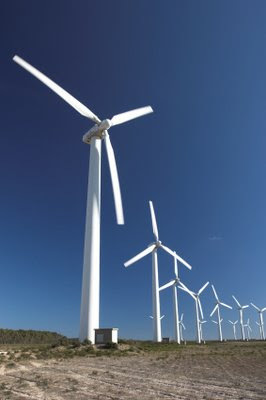 Another problem is the lack of transmission lines to get power from the wind turbines into the electricity grid. This project is the poster child for the futility of trying too hard to implement green energy. It is dramatic evidence that while the Congress and the Obama administration, the environmental lobby and the global warming/global cooling/climate change faction all want to move away from fossil fuels as fast as possible, the new technologies, the nation's electrical infrastructure and the existing energy system quite plainly are not ready for this transition. “It was a little more complicated than we thought,” Mr. Pickens told The Dallas Morning News, a bit of understatement that supports a point made here more than a couple of times. His comment surprises a lot of folks who expected a savvy businessman like T. Boone Pickens not to make an error characteristic of rookies. But shortsighted decisions like this one are part and parcel of the rabid green movement, which attempts to implement immature technologies at virtually any cost without having taken a long, sober look at the problems that must be conquered first. To his credit, and unlike so many others in the green energy lobby, Mr. Pickens recognized the futility of this plan, and sensibly abandoned the project. Someday the United States will be ready for this transformation, and sensible people will wait until then to make the move. What the Congress, the administration, the environmentalist fringe and the greenies must do is adopt a position of thoughtful analysis, and move as quickly as possible, but as deliberately as necessary, to get to that point. In watching Barack Obama work to enact his agenda one gets the idea that he either is unaware of the obstacles these measures face, or he just doesn’t care. But even if all the changes he wants to bring about are good ideas – and they definitely aren’t – it’s just not prudent, or possible, to do everything so quickly and all at the same time in this economic environment without making a series of critical and costly mistakes. Fortunately, as time passes and more of the details of the President’s radical plans become known, resistance grows. As the United States government tries to force-feed green energy to the American people and jam it into a market that is unprepared to accept it, our President is trying to get the world’s developing nations – among which are China and India, two of the fastest growing users of fossil fuels – to clean up their high-polluting factories. They are saying, however, “No way. It will wreck our economy.” Those nations understand what Mr. Obama apparently does not understand: That implementing an energy policy for ideological reasons, and against market forces, is foolish and dangerous. As for Mr. Pickens’ goal of reducing oil imports, it doesn’t take building wind farms for which the supporting infrastructure is non-existent to accomplish that goal. All that is required is to ease government restrictions and remove obstacles to drilling where domestic oil and gas reserves lie, and allow American energy companies to do what they do best. This simple solution would increase domestic oil and gas supplies and the oil and gas industry would continue efforts to clean up oil and gas emissions, it would allow the technologies for alternative energy sources to develop naturally along with the infrastructure to support them. This approach not only has the advantage of making a lot of sense, but also has the support of the energy industry, which is the leading investor in developing new, less polluting ways to use existing fossil fuels, and also in developing alternative energy sources. But the doctrinaire Left is in charge, driving full speed ahead, looking neither left nor right, nor much past the hood ornament up front.